Recycled magazine and catalog pages are cut and rolled into beads. Each bead is a time capsule reflecting the images of our times in advertising and events. 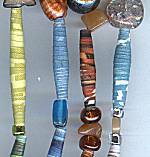 Color stories are gathered then into a finished piece of jewelry, combining the paper beads with gemstones and glass. Each magazine bead is sealed to protect it while wearing, but not suited for swimming or showering. If an edge gets torn, use a dab of super glue to set it right!